What a cool day today. My mom wake me up at 12 and told me to cook. " Iman, pegi potong2 bawang smua . Kn kamu nk buat spaghetti harini." And I was like, wahh excited ni. Dh la perot lapar n aku plak yg kena masak sndiri. But luckily mak aku supervise aku. Haha. By the way. 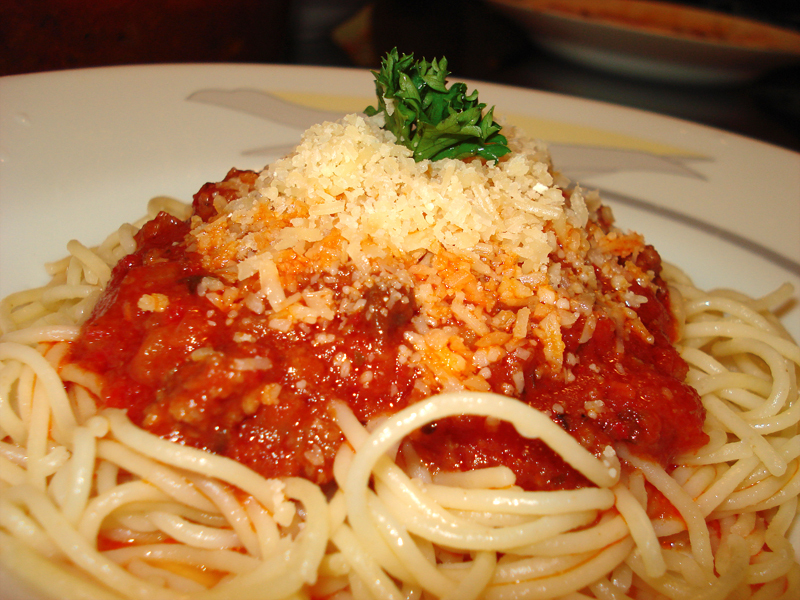 today im going to cook Spaghetti Bolognese, an Italian dish which is famous throughout the world. Before I even dare myself to cook this dish by myself, I already prepared myself. Such as knowing the ingredients, the herbs to be used, which ingredient to be put first etc. I always dreaming of cooking delicate Western dishes like spaghetti and owning a famous restaurant when I grew up. So I guess this is somewhat a stepping stone for me. Haha. This dish is really simple actually. A lot of my friends already knew how to cook this dish. So I'm kinda jealous of their achievement. Haha. Ok, first chop up the onions and garlic. Chop the tomatoes into dices. Kalau nk kuah dia lagi kaw, tambah lagi sebijik dua tomato. 1. Heat up the pan. Add in some olive oil. If you dont have olive oil, vegetable oil pun boleh. 2. When the oil is already hot, pour in the onions and garlic. Cook until it turns to golden brown. Then, pour in the minced meat/ daging kisar cap Ramli. 3. After some 15 minutes or 20 minutes, the meat will be tender and even with the onions and garlic. Then, pour in the diced tomatoes. Mix them until they are even. Now, you can add chili sauce and blended chillies. Chili sauce is used to add some sour taste to the spaghetti's sauce. Mix them well. 4. Afterwards, pour in the secret recipe, Prego Sauce. Carefully stir the sauce . Let it cook for 10-15 minutes. If you want your sauce to have authentic Italian taste, add in some herbs such as Oregano leaves and black pepper. If you dont have fresh Oregano leaves, there are oreganos which are ready made in bottle. 5. Add some salt. Tambah garam secukup rasa ye. Let it cook for another 10 minutes. Then, you're done with your sauce. 6. Now with the pasta, you just need to cook it just like the way you cook maggi. Add hot water into a pot, let it boil, then boil the pasta until it turns soft . Add some salt into the hot water. 7. Ok. With the pasta and the sauce done, serve it with some Parmesan cheese. You also can chop some Parsley leaves and add them to your dish if you have them. Finally, a delicious dish done. VOILA ! !